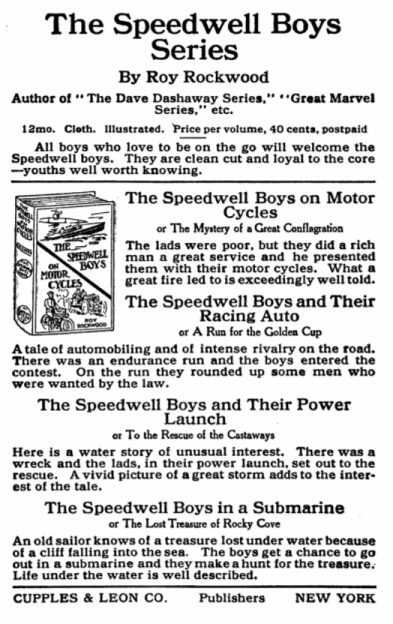 The Speedwell Boys is a five volume series of adventure tales for boys with an emphasis on speed. 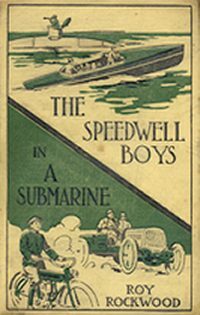 Created by the Stratemeyer Syndicate and issued under their house name Roy Rockwood. 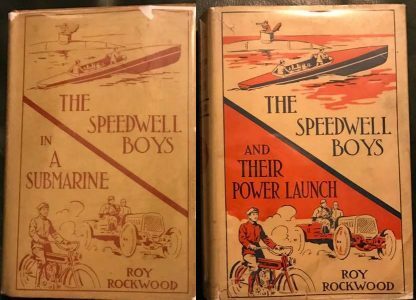 Roy Rockwood was a popular Syndicate house name and was used on Bomba the Jungle Boy, Dave Dashaway, The Great Marvel Series, The Speedwell Boys, and other publications. 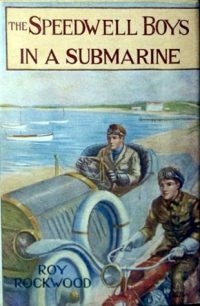 All the stories are in the public domain and some are available for free on Project Gutenberg and in low priced reprint editions available from Amazon.com. Yellow to tan cloth binding, black lettering; pictorial front in green & black. Spine has green circle. Illustrations: (1-5) frontispiece on coated paper. Dust Jacket: Yellow coated paper, line pictorial in dark red lettering & artwork. Same for all books. Dust Jacket: Yellow coated paper with black and red artwork. Same for all books. Same as 1 except all lettering & artwork in black only. Dust Jacket: White coated paper with color artwork. Same for all books. Click on any cover to enlarge it. "The lads were poor, but they did a rich man a great service and he presented them with their motor cycles. What a great fire led to is exceedingly well told." 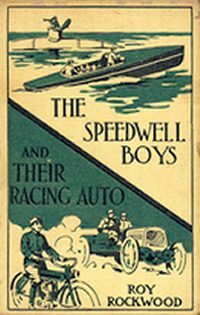 "A tale of automobiling and of intense rivalry on the road. There was an endurance run and the boys entered the contest. On the run they rounded up some men who were wanted by the law." "Here is an unusual story. 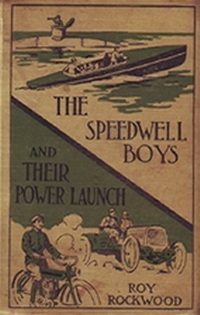 There was a wreck, and the lads, in their great power launch, set out to the rescue. A vivid picture of a great storm adds to the interest of the tale." "Track athletics form a subject of vast interest to many boys, and here is a tale telling of great running races, high jumping, and the like. Fred again proves himself a hero in the best sense of that term." "The boys had an idea for a new sort of iceboat, to be run by combined wind and motor power. How they built the craft, and what fine times they had on board of it, is well related."